"...In the celebration of the Eucharist, bread and wine become the Body and Blood of Jesus Christ.... What does it mean that Jesus Christ is present in the Eucharist under the appearances of bread and wine? How does this happen? The presence of the risen Christ in the Eucharist is a...mystery that the Church can never fully explain in words. 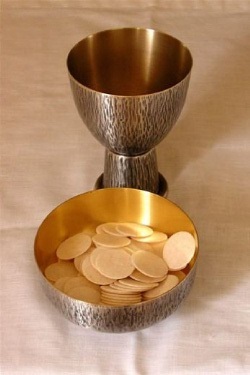 Jesus gives himself to us in the Eucharist as spiritual nourishment because he loves us." To get a better understanding why Eucharist is at the center of all we believe, click on the image below.